Luxury vinyl flooring is a smart choice, as it can be maintained easily, is economical and long lasting. The beautiful look of a wood grain from an exotic tree species is printed onto the vinyl, so you have the look without the high costs of hardwood flooring. It comes in an array of hues, patterns and grain sizes, to give the appearance of hardwood floors. Whether you go for traditional, exotic, or rustic wood looks, there are many design ideas for you to choose from that will fit your personal style! Vinyl floors have a foam layer that create a comfortable and soft feel, while still being durable and stain resistant. So if you’re standing for extended periods of time, this is the perfect choice for you. Some vinyl floor products also come with a sound barrier layer to muffle footsteps. Vinyl floors are used in commercial and residential spaces as it’s tolerant of high traffic, resistant to spills and abrasions. It’s water proof and low maintenance capabilities make it a highly sought after option at restaurants and commercial offices. The trends, designs, grains and hues that are available in vinyl floor options on the market, are extensive. In 2019 vinyl manufacturers will be producing even more looks that will mimic the latest texture trends and the most sought after hardwood flooring style. 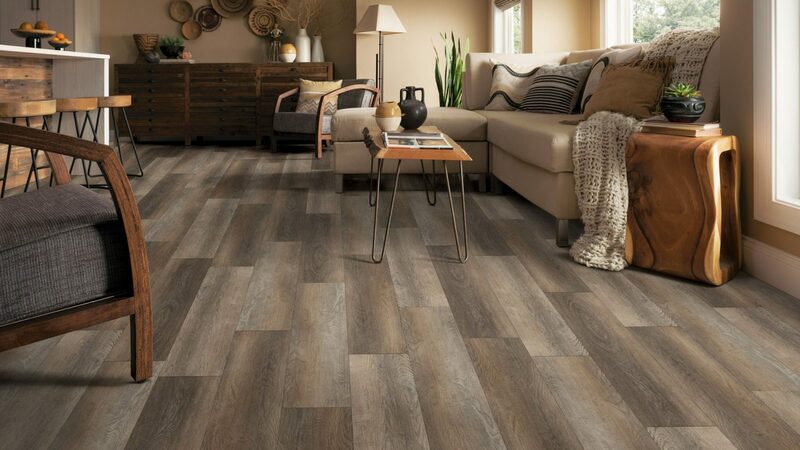 GC Flooring Pros is proud to offer the latest trends in vinyl flooring as well as hardwood flooring. To book your free in-home consultation, please contact us at:214-814-1177 or fill out the estimate request form by clicking here.